When guest columnist Katrin Silva wrote about her ultra running experiences in this column, she mentioned the Western States 100 trail. 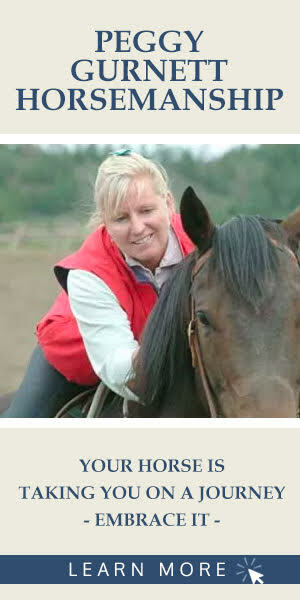 It covers the same path run by horses in the famous Tevis Cup race. We put the question to the test in a pair of contests a few years ago, when we were living in Iowa. 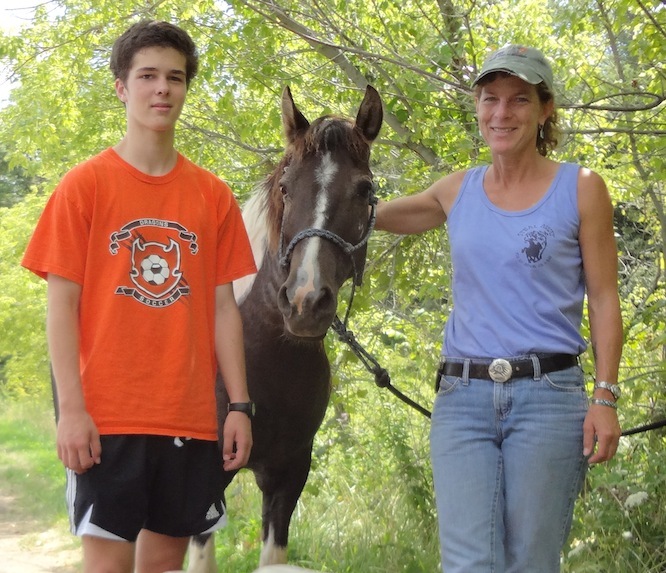 Maddy Butcher and her son, Cormick Gaughran, took to the trails with spirit. My son, Cormick, was feeling pretty smug when I proposed a rematch. 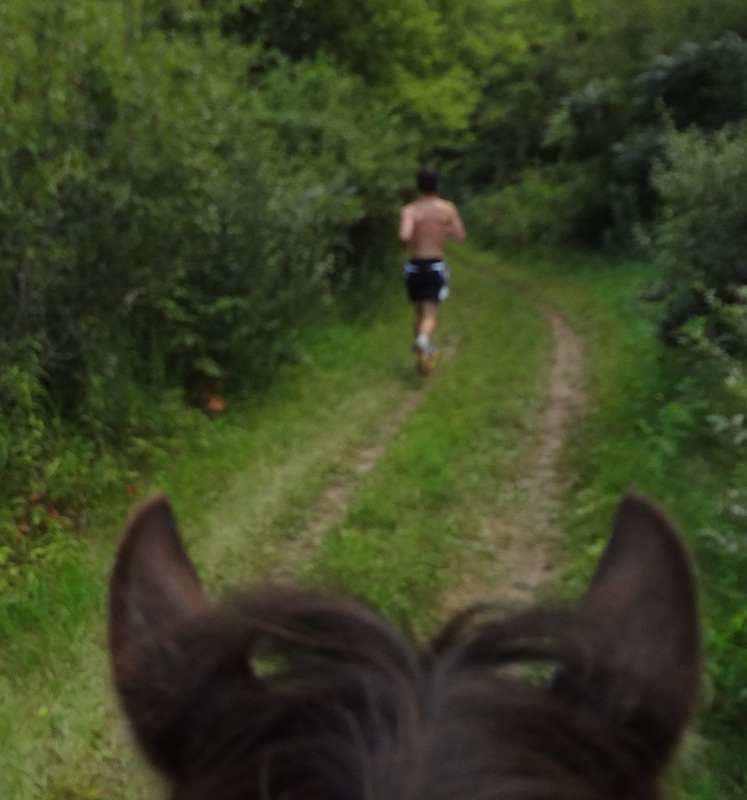 He’d outrun Comet and me over the long, rugged Pleasant Creek loop. This time, I said, let’s see how you do against Pep and me. Pep is Peppermint the Pony. If Comet is a gazelle, Pep is a buffalo. If Comet is a wide receiver, Pep is a running back. I gave Cormick seven minutes or about a mile headstart. We headed out of the parking lot at a trot and maintained it for five minutes with Pep sniffing the ground and looking all around, as she usually does when first heading out on the trail. Pep was much more go-ey than Comet at this stage and there was no hesitation in her stride. At three miles, we were beginning to see glimpses of our rival as he chomped away at the route. Cormick was maintaining a strong, seven-minute per mile pace and it would take a certain amount of tenacity to catch him. By halfway, Pep understood we were pursuing Cormick and embraced the mission. Despite the sunny, warm day, she dug in and churned down the trail like a one-horse Pony Express. 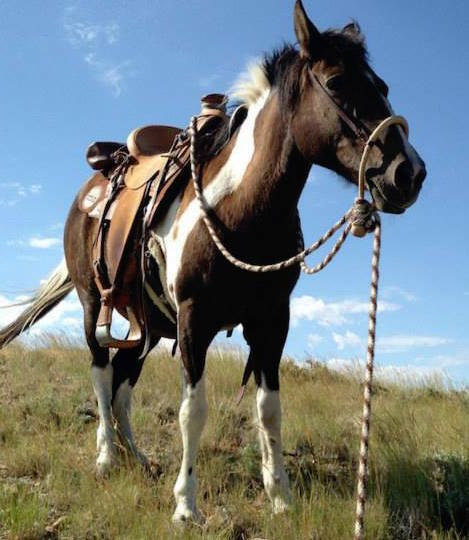 We altered between loping and trotting, and walked only when necessary (like rough terrain or bridges). With a mile to go, we caught our rabbit. The three of us jogged the last stretch together and finished, good and spent, heads lowered in unison. The hilly, eight-mile plus loop took about 70 minutes, a full 10 minutes faster than with Comet. Needless to say, this begs the question: Who’s faster – a lithsome, long-legged Comet or the stocky, short-legged Pep? 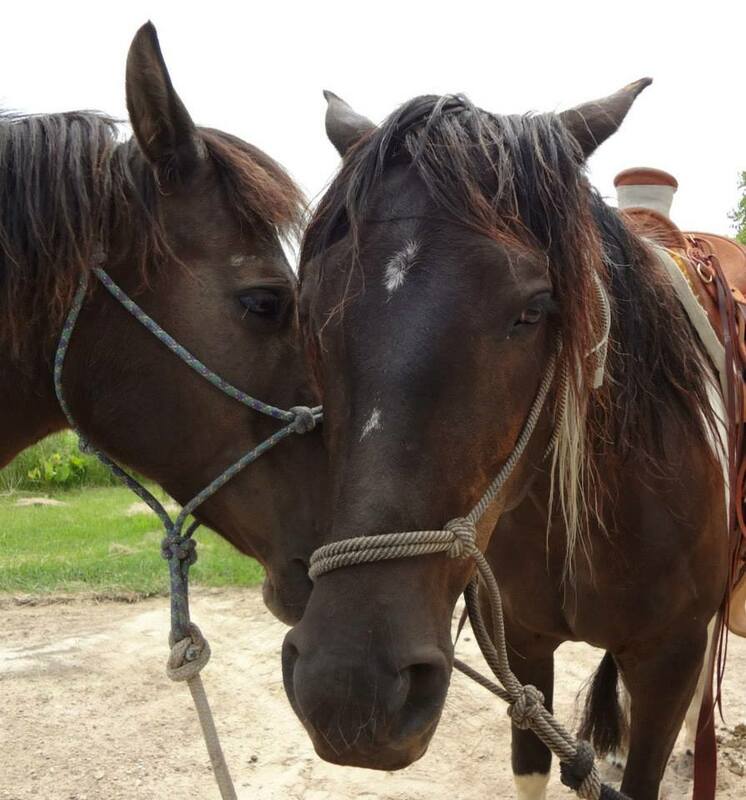 Horse and rider connection is golden. Posted in General, On the Trail.